Can quads get any smaller? First we had 250s, then 210s, and now here's a fantastic little 130 size quadcopter from Tarot. While it may be small, it still just as capable as its bigger brothers. The Tarot 130 racing drone is a H-frame quad made from strong carbon fibre. It weighs only 140 grams and that's with battery included! So as you can imagine it's pretty quick! It has got 4000Kv motors paired with 6A BHeli ESCs and 3020 props; together they deliver responsive power and plenty of punch. The flight controller is Tarot's version of the popular Naze32 and Cleanflight compatible. Best of all, it arrives pre-configured and pre-tuned, making it truly Almost Ready to Fly (ARTF). If you are using a SBUS receiver you only need to plug it in and you are away. If you are using a PPM or PWM Rx you just need to change a setting in Cleanflight. The Ready to Fly (RTF) version also comes pre-configured and tuned. It comes with the fantastic FlySky Fs-i6 radio and a micro PPM receiver already installed, ready for you to fly straight away. The FC supports voltage monitoring, so its buzzer can be configured to sound when you need to land and it can also be setup as a handy lost model alarm. On the FPV side of things, it features are 300mW 5.8GHx Tx which is good for a range of 400m plus, and a wide-angle camera which is on a tiltable mount. As FPV racing drones go, you don't get anymore almost ready to fly than this one, which makes the Tarot 130 fantastic for beginners and experienced pilots alike. Thanks to its small crossover size, it can be flown indoors and outdoors. Required: 3S 400-550mAh (JST) LiPo - here. Required: 3S 400-550mAh (JST) LiPo - here. 5-6 Channel SBUS, PPM or PWM Rx (Only ARTF). 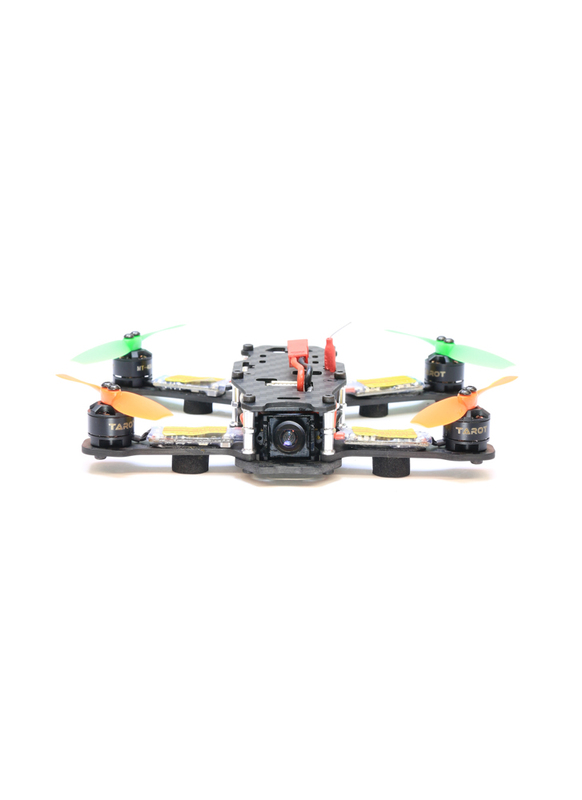 Compatible Futaba FHSS SBUS Receiver / FASST Receiver / Spektrum DSM2 / Spektrum DSMX / Frsky X9D Taranis. 3S 400-550mAh (JST) LiPo - here. 3020 Prop set - here. Upgrade 3030 Bullnose Prop set - here. 6A BLHeli ESC - here. PDB / FC - here. To plug in the USB cable for programming, you have to remove the spacer in front of the port (a little bit annoying yes, but you only have to do it once). The ESCs are held to the frame using adhesive tape, we recommend securing them with some cable ties to make sure they don't go anywhere. Important: If you get the following error message when connecting to Cleanflight (WARNING: the firmware on this device needs upgrading to a newer version. Use CLI for backup before flashing..') it means the FC is running earlier firmware than the latest Cleanflight GUI version >2.0. Instead of reflashing the FC which is difficult for this board, please install Cleanflight version 1.2.4. Download here / Instructions here. 3S 550mAh LiPo - available here. NEW Upgrade Props - Bullnose 3030 for lots MORE Thrust! ​Note: Please check with your local authorities regarding the operation of this equipment before you purchase. Regulations on power output, usable frequencies and licenses’ to operate vary from region to region. Display: 128*64 dot matrix with white backlight. How do I switch between Angle and Acro? Switch C is setup to control the mode, Angle is top position, Acro bottom position. is it possible to the a spare frame for the tarot 130? We don't stock the spare frame, however we could order you one in. can i use it with this quad? Yes you can, it's a little large, but it flys perfectly well with it. Is this able to be linked to a Futaba T7C? Yes, you would connect using a PWM receiver. what kind of connector do the flight controller have? i have TAROT TL2956 LED lights. i need connector to FC.but i don know the type or the name of them. Compatible with spektrum dx6i tx? Hi there. Is this model compatible with a spektrum dx6i tx please? Hi, thanks for the question. Yes it is using a PWM receiver. We will be uploading a compatible PPM (single wire) receiver to the website soon. Is this drone compatible with the devo7 and skyzone goggles? Hi Peter, it is compatible with the Skyzone goggles and also with the Devo7 if you use a Walkera PWM receiver. The problem is all PWM receivers are a little big, I think you would struggle to find room to fit the receiver. A radio that works really well with the Tarot 130 is the Flysky FS-i6S, it comes with a micro receiver, which fits easily and is plug and play. Hi, is this drone compatible with the Turnigy Evolution Digital AFHDS 2A radio? Yes it is, using a PPM Rx.